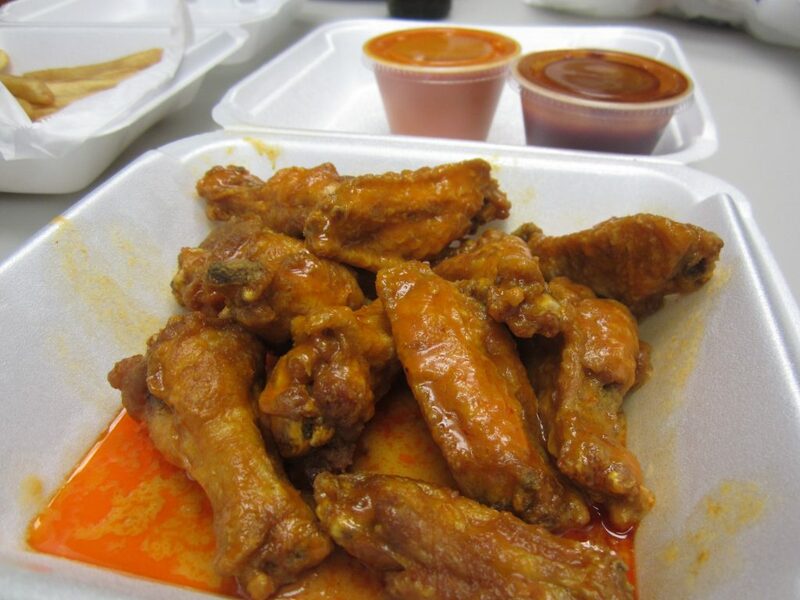 Wings To Go is a national chain that is your typical grab and go wing stop. You are not meant to hang out and eat on premises (which is made clear by little to no tables) as they are meant to be enjoyed in the comfort of your own home. I stepped into this strip mall store and ordered up a ten count of their signature “Hot” sauce. I gazed at the poster on the wall that claimed that I would want their hottest sauce “Homicide” only on a dare… and I am a man who likes a good challenge, so I got a side of that to see what kind of punch it had. I took the order back to the shop and cracked open the Styrofoam container to see what waited for me on the other side. The first thing that I noticed was a slightly smaller sized group of wings with a light coverage of sauce and a nice aroma. But, when I got a little closer and took the first bite, I noticed that the oils were already separating from the sauce and the taste wasn’t that pleasant. The wings themselves were slightly floured and had a normal tenderness to them, but the sauce was not a winner in my book (which is what they are supposed to be known for). Not only did it have a green vegetable flavor to it and wasn’t that hot (coming from the middle of their 6 buffalo sauce list, I figured it would have some heat), but it left an aftertaste of what can only be described as – funk. With the “Hot” sauce not doing the trick, I popped open the “Homicide” sauce (which by the way is one hotter than “Suicide” so you know it meant business) and took a good whiff. I have to be honest when I say that this stuff smelled so bad that I didn’t even want to try it. It reminded me of a liquorice liquor shot that you are handed when you just turn 21 and your buddy is over your shoulder saying “c’mon man, drink it!” with a sly grin on his face. I sucked it up for journalistic purposes, poured it over the last wing, and took a big bite. The sauce had a lot more heat to it, but was more like “liquid smoke” or another heat substitute than an actual pepper and fell a bit flat. The good news is that they weren’t inedible, and I was able to finish my dish to get my money’s worth. In the land of take-out wings they may have scored a bit higher, but in my quest to find the best wings, they were not even on the radar. So if you are looking to order some wings for delivery, give them a whirl and let me know what you think. But if you are walking by, my advice is to keep walking and find a bar to get some wings that are not in this “fast food” category.